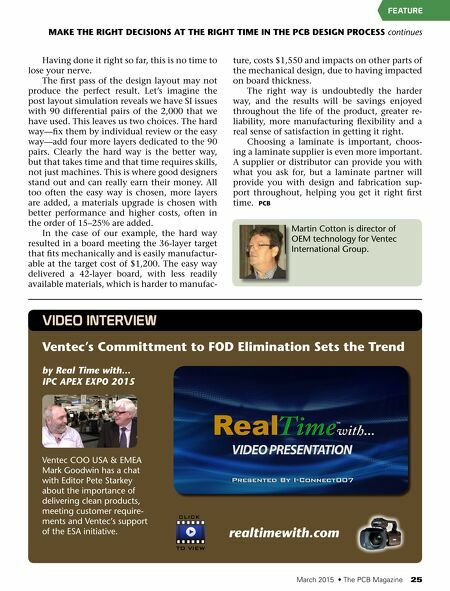 24 The PCB Magazine • March 2015 MAkE THE RIGHT DECISIONS AT THE RIGHT TIME IN THE PCB DESIGN PROCESS continues Feature and trace width. 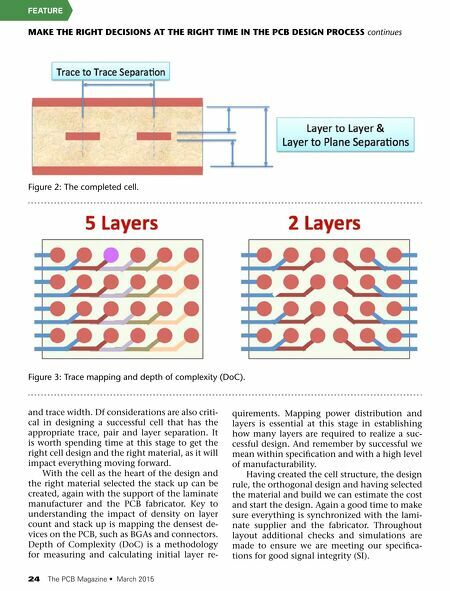 Df considerations are also criti- cal in designing a successful cell that has the appropriate trace, pair and layer separation. It is worth spending time at this stage to get the right cell design and the right material, as it will impact everything moving forward. With the cell as the heart of the design and the right material selected the stack up can be created, again with the support of the laminate manufacturer and the PCB fabricator. Key to understanding the impact of density on layer count and stack up is mapping the densest de- vices on the PCB, such as BGAs and connectors. Depth of Complexity (DoC) is a methodology for measuring and calculating initial layer re- quirements. Mapping power distribution and layers is essential at this stage in establishing how many layers are required to realize a suc- cessful design. And remember by successful we mean within specification and with a high level of manufacturability. Having created the cell structure, the design rule, the orthogonal design and having selected the material and build we can estimate the cost and start the design. Again a good time to make sure everything is synchronized with the lami- nate supplier and the fabricator. Throughout layout additional checks and simulations are made to ensure we are meeting our specifica- tions for good signal integrity (SI). figure 2: The completed cell. figure 3: Trace mapping and depth of complexity (DoC).